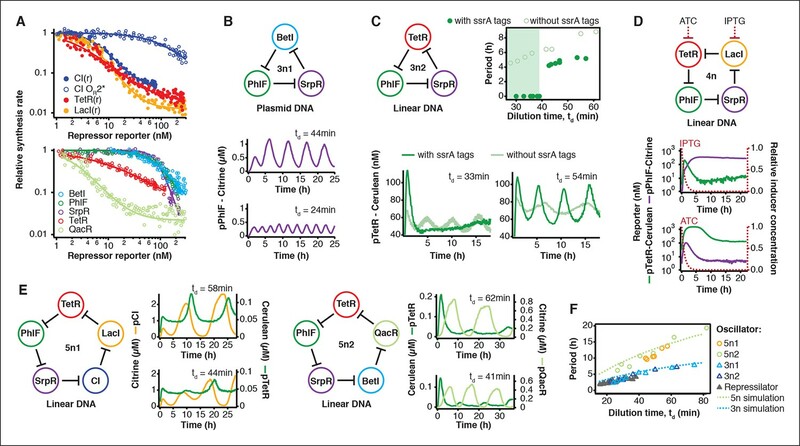 While complex dynamic biological networks control gene expression in all living organisms, the forward engineering of comparable synthetic networks remains challenging. The current paradigm of characterizing synthetic networks in cells results in lengthy design-build-test cycles, minimal data collection, and poor quantitative characterization. Cell-free systems are appealing alternative environments, but it remains questionable whether biological networks behave similarly in cell-free systems and in cells. We characterized in a cell-free system the ‘repressilator’, a three-node synthetic oscillator. We then engineered novel three, four, and five-gene ring architectures, from characterization of circuit components to rapid analysis of complete networks. When implemented in cells, our novel 3-node networks produced population-wide oscillations and 95% of 5-node oscillator cells oscillated for up to 72 hr. Oscillation periods in cells matched the cell-free system results for all networks tested. An alternate forward engineering paradigm using cell-free systems can thus accurately capture cellular behavior. Engineers often use simplified models to test their ideas. For example, engineers test small-scale models of new airplane designs in wind tunnels to see how easily air flows by them. This saves the engineers the time and expense of building a full-sized aircraft only to learn it has serious design flaws. The interactions of genes and proteins within living cells can be incredibly complex, and working out how a particular network works can take months or years in living cells. To try to speed up and simplify the process, scientists are developing models that do not involve cells. These models replicate the chemistry inside of the cells and allow scientists to observe complex interactions between genes, proteins and other cellular components. Some scientists have recreated complex patterns of gene expression in these cell-free models, but these systems still take a long time to make. It is also not yet clear whether these models accurately depict what happens in living cells. Now, Niederholtmeyer, Sun et al. have created a cell-free system that allows the interactions of a large network of genes to be examined in a single day – a process that would previously have taken weeks or months. To test the model, Niederholtmeyer, Sun et al. recreated how networks of genes in the bacterium Escherichia coli interact to form “oscillations”, which produce a regular rhythm of gene expression. When the cell-free oscillator networks were inserted into live E. coli cells, the oscillators continued to produce the same patterns of gene expression as they did outside the cells. Overall, the experiments show that cell-free models can accurately reproduce, or emulate, the behavior of cellular networks. This work now opens the door for engineering ever more complex genetic networks in a cell-free system, which in turn will enable rapid prototyping and detailed characterization of complex biological reaction networks. A central tenet of engineering involves characterizing and verifying complex systems in a simplified environment (Lu et al., 2009). Electronic circuits are tested on a breadboard to verify circuit design and aircraft prototypes are tested in a wind tunnel to characterize their aerodynamics. A simplified environment does not exist for characterizing and engineering complex biological networks, requiring system analysis to be conducted primarily in cells. Performing extensive, quantitative and rapid network characterization in cells is limited due to difficulties associated with measuring parts, components, and systems in complex and ill-defined cellular hosts (Kwok, 2010). Particular problems include: I) lack of precise control over network component concentrations, II) unpredictable interactions and integration with host cell processes, III) cumbersome molecular cloning, and IV) technical challenges and limited throughput associated with single cell measurements. Cell-free systems promise to be efficient and effective tools to rapidly and precisely characterize native and engineered biological systems to understand their operating regimes. Reconstituted biochemical systems have allowed the study of complex dynamic and self-organizing behaviors outside of cells such as switches, oscillators and pattern-forming regulatory networks (Schwille and Diez, 2009; Genot et al., 2013; van Roekel et al., 2015). 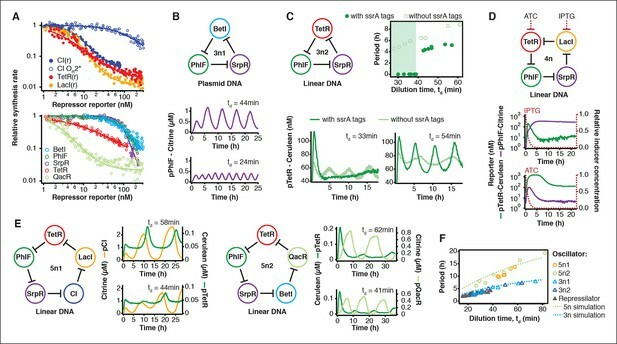 Networks assembled from simplified biochemistries such as oligonucleotide polymerization and degradation reactions can produce complex behaviors such as oscillations and provide insights into the working principles of biological regulatory systems (Genot et al., 2013; van Roekel et al., 2015). While a high degree of abstraction and simplification makes it easier to analyze the underlying principles of biological networks, it becomes challenging to implement more complex networks and to directly transfer results and networks between the cell-free and the cellular environment. Implementation of genetic networks in transcription-translation reactions has gained considerable traction because they rely on the cellular biosynthesis machinery and are compatible with a broad range of regulatory mechanisms. A growing number of synthetic gene networks with increasing complexity have been implemented in cell-free transcription-translation systems (Noireaux et al., 2003; Shin and Noireaux, 2012; Takahashi et al., 2015; Pardee, 2014). We and others have recently shown that oscillating genetic networks can be implemented in vitro outside of cells using microfluidic devices (Niederholtmeyer et al., 2013; Karzbrun et al., 2014). However, whether these cell-free systems reflect the cellular environment sufficiently well to be of significance to biological systems engineering and analysis remains an open question. A few studies investigated whether individual components such as promoters and ribosomal binding sites express at comparable strengths in cell-free systems and in cells (Sun et al., 2014; Chappell et al., 2013). Comparisons of the behavior of genetic networks in cell-free systems and in cells are still limited to a few examples such as repressor-promoter pairs (Chappell et al., 2013; Karig et al., 2012) and a RNA transcriptional repressor cascade (Takahashi et al., 2015). Thus far, however, it has not been shown whether genetic networks with complex dynamic behavior function similarly in cell-free and cellular environments. Here, we demonstrate that cell-free systems can be used to characterize and engineer complex dynamic behaviors of genetic networks by implementing and characterizing novel 3-node, 4-node, and 5-node negative feedback architectures in vitro. We go on to show that our 3- and 5-node oscillator networks were functional in cells and that their periods were comparable to those observed in the cell-free system, indicating that the cell-free system accurately emulated the cellular environment for the complex dynamic networks developed and tested in this study. Cells carrying our 3-node networks oscillated on a population level, which was previously only observed in actively synchronized oscillators using quorum-based coupling (Danino et al., 2010). The in vitro and in vivo oscillations of our 5-node negative feedback networks confirm theoretical predictions on biomolecular ring oscillators and represent the largest synthetic negative feedback networks implemented simultaneously in cell-free systems and in cells. Cell-free expression systems prepared from an E. coli extract (‘TX-TL’) can preserve the endogenous E. coli transcription machinery as well as native mRNA and protein degradation mechanisms (Shin and Noireaux, 2010a; 2010b; 2012; Sun et al., 2013). We have recently described a microfluidic nano-reactor device capable of emulating cellular growth and division. A discontinuous flow of TX-TL reagents through miniaturized reactors at rates matching natural E. coli dilution rates keeps transcription and translation rates at constant steady state levels and removes reaction products, which is critical for the implementation of dynamic genetic networks (Niederholtmeyer et al., 2013). Using a TX-TL expression system in the microfluidic nano-reactor device thus provides a simplified and controlled environment, which can be applied to rapid prototyping (Sun et al., 2014) and characterization of genetic networks (Figure 1, top, Figure 1—figure supplement 1). In addition, TX-TL provides significant time savings over traditional prototyping in cells (Figure 1, bottom, Figure 1—source data 1). Linear DNA can be used in lieu of plasmid DNA, and the DNA source does not require specific compatible origins of replication or antibiotic markers. Therefore, DNA can be assembled completely in vitro based on premade modules within 3 hr (Sun et al., 2014). Importantly, the time needed does not scale with circuit complexity, as each circuit component can be added as a separate linear template, which can be easily replaced or varied in concentration in following design-build-test cycles. This is particularly advantageous for large circuits, where dosage or part changes require extensive re-cloning of plasmids for cellular testing, but no additional time for in vitro testing. 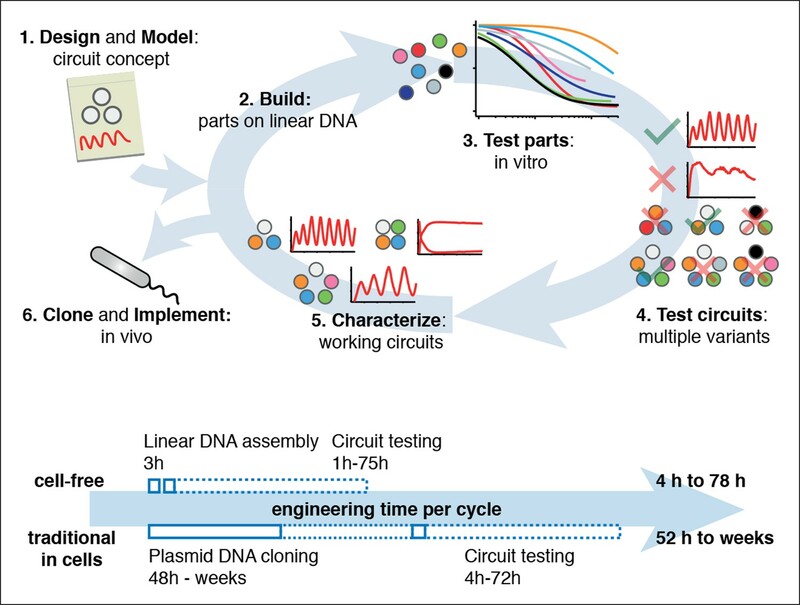 We estimate that prototyping a genetic circuit in TX-TL requires 4 to 78 hr, as opposed to prototyping in E. coli, which requires a minimum of 52 hr to several weeks. Cell-free systems allow rapid and extensive characterization of biological systems. Schematic representation of the design-build-test cycle using the cell-free system (top). A design is first modeled to obtain intuition about the architecture. Parts are then assembled on linear DNA without cloning, and tested in vitro. With functional parts, circuit variants can then be tested and working circuits can be extensively characterized. Final circuits are cloned onto plasmids and implemented in vivo. For a specific example of the cell-free system applied to engineering a 5-node oscillator network see Figure 1. 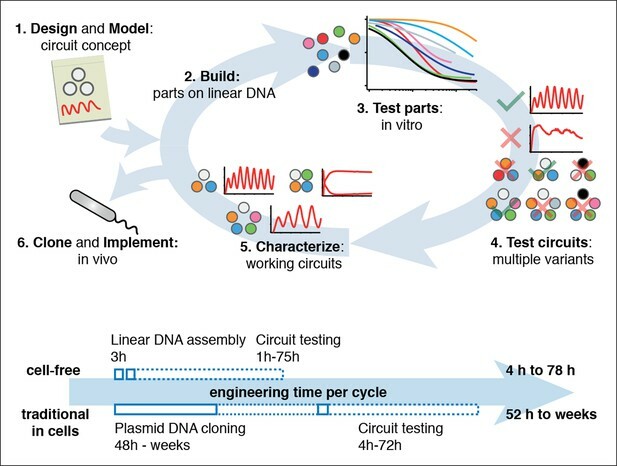 Bottom shows a comparison of the time required for testing a genetic circuit by the cell-free approach versus traditional engineering in cells. We asked whether this cell-free system could be used to run and characterize an existing synthetic in vivo circuit and chose to test the repressilator (Elowitz and Leibler, 2000) as a model circuit. 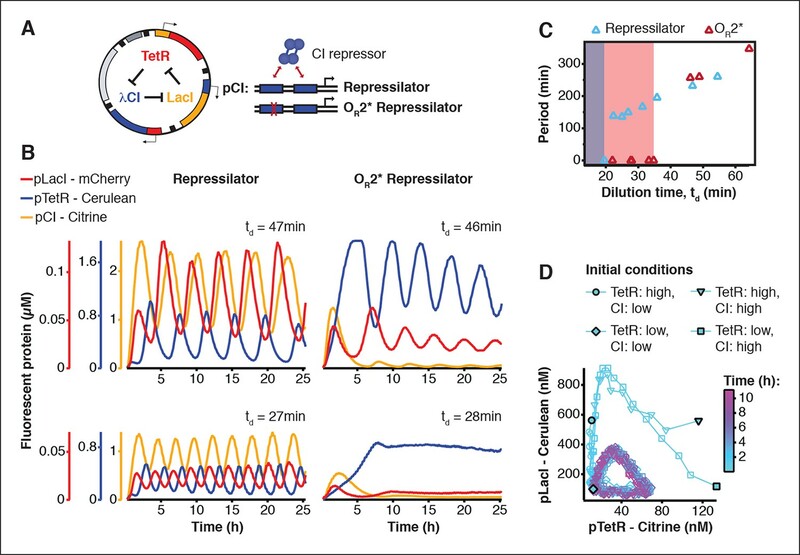 We successfully implemented the original repressilator network in our cell-free system and observed long-term sustained oscillations with periods matching the in vivo study (Figure 2, Video 1). We compared the original repressilator to a modified version containing a point mutation in one of the CI repressor binding sites in the promoter regulating LacI (Figure 2A). This mutation increases the repressor concentration necessary for half-maximal repression (K), and reduces cooperativity (Rosenfeld et al., 2005). At long dilution times (td) both circuits oscillated, but with shifted absolute reporter protein concentrations (Figure 2B). At decreasing dilution times amplitudes decreased and periods became faster with a linear dependence on td. Faster dilution times, however, did not support oscillations for the modified network (Figure 2B,C). Experimentally, the range of dilution times supporting oscillations can serve as a measure for robust oscillator function, which generally diminishes with decreasing synthesis rates or when binding of one repressor to its promoter is weakened as in the OR2* mutant (Figure 2—figure supplements 1–3). Initial conditions can influence the dynamic behavior of nonlinear systems but are difficult to control in cells. In order to explore the dynamics of the repressilator in response to different initial conditions we varied the starting concentrations of TetR and CI repressor. For all conditions tested the system quickly approached limit cycle oscillations and was invariant to initial conditions (Figure 2D). This analysis of the repressilator network in phase space provides an example for an experimental characterization that would be challenging or impossible to perform in a cellular environment. (A) Application of cell-free systems to characterize the original repressilator (Elowitz and Leibler, 2000) and a modified version with a point mutation in the CI promoter (OR2*) located in one of the binding sites of the CI repressor. (B) Expression from the three promoters of the repressilator and the OR2* version at different dilution times. (C) Oscillation periods of the repressilator as a function of dilution time. In the OR2* version sustained oscillations were supported in a narrower range of dilution times as compared to the original repressilator network. 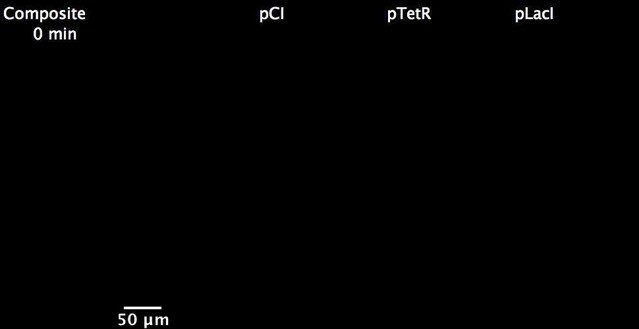 (D) Phase portrait of repressilator oscillations starting from different initial TetR and CI repressor concentrations. 3-color in vitro run of repressilator at td = 47 min. Shown on the right are individual channels of pCI-Citrine-ssrA, pTetR-Cerulean-ssrA, and pLacI-mCherry-ssrA. These are combined in the composite at the left. The cell-free system also allows rapid characterization of individual network components. We measured the transfer functions of repressor-promoter pairs in the repressilator network (Figure 3A, Figure 3—figure supplements 1–3, Figure 3—source data 1) and found that the network is symmetric in terms of transfer functions. In the CI promoter OR2* mutant we observed the expected shift in K value and decreased steepness of the transfer function. We also characterized TetR repressor homologs as building blocks for novel negative feedback circuits (Figure 3A) and with the exception of QacR observed similar transfer functions as observed in vivo (Stanton et al., 2014) (Figure 3—figure supplement 3). Cell-free prototyping and characterization of novel negative feedback circuits. (A) Transfer functions of the repressilator repressor-promoter pairs (top) and TetR homologs (bottom). The TetR repressor was tested against two different promoters: the promoter used in the repressilator (top panel) and the J23119-TetR promoter (Stanton et al., 2014) (bottom panel). Lines are Hill function fits. (B) Oscillations of a novel 3-node ring oscillator (3n1) constructed on plasmid DNA. (C) Two versions of a second 3-node ring oscillator (3n2) on linear DNA were used to study the effect of ClpXP degradation on oscillator function. One version was ssrA-tagged on all repressor genes while the other version did not carry degradation tags on the repressors. The same reporter with a medium-strength degradation tag was used in both versions. (D) A 4-node cyclic negative feedback network on linear DNA has two stable steady states that depend on the initial conditions. IPTG switched the network into the state where pPhlF was on and pTetR off. An initial pulse of aTc resulted in the opposite stable steady state. (E) Oscillations of two novel 5-node ring oscillators (5n1, 5n2) constructed on linear DNA. (F) 5-node ring oscillators oscillate with longer periods than 3-node ring oscillators, as predicted by simulations (Materials and methods) and shown by experimental data. Using three new repressors, BetI, PhlF and SrpR, we constructed a novel 3-node (3n) circuit, 3n1, and observed high-amplitude oscillations over a broad range of dilution times with the same dependence of amplitude and period on td as for the repressilator (Figure 3B). In our characterization of the repressilator network and the 3n1 oscillator we found dilution rates to be critical for the existence, period and amplitude of oscillations. Protein degradation is similar to dilution in that it results in removal of repressor proteins. In order to study the effect of degradation we constructed a second 3n network (3n2) using TetR, PhlF and SrpR repressors on linear DNA. One version of the circuit used strong ssrA ClpXP degradation tags, while the second used untagged repressors. We observed oscillations for both circuits (Figure 3C). However, the circuit without ssrA-tag mediated protein degradation exhibited slower oscillations, which extended to lower dilution times, showing that protein degradation, just like dilution, affects oscillator function and period. Effects of ClpXP-mediated protein degradation, which have been shown to be important for existence and frequency of oscillations in vivo (Cookson et al., 2011; Prindle et al., 2014), can thus be emulated in a cell-free environment. We characterized the repressilator (Figure 2) and the novel 3n1 network (Figure 3B) on plasmid DNA, reasoning that this is the closest approximation to the situation in a cell and because promoter strengths compare better when measured on a plasmid (Sun et al., 2014; Chappell et al., 2013). However, for a more rapid analysis of novel networks and network variants it is advantageous if laborious cloning steps are not required to obtain initial results on circuit performance. Construction and comparison of two 3n2 network variants, which only required a few PCR reactions to synthesize the linear DNA templates, showed that it is possible to go from theoretical design of a circuit to first experimental results in a very short timeframe (Figure 3C). Next, we went on to test this concept for novel and more complex network architectures. Theory predicts that ring architectures built from an odd number of repressors oscillate, while even-numbered architectures have stable steady states (Smith, 1987; Hori et al., 2013). We experimentally built and tested a 4-node circuit from LacI, TetR, PhlF and SrpR on linear DNA. Initial pulses of LacI inducer IPTG or TetR inducer aTc allowed us to switch expression into either one of the two stable steady states (Figure 3D). Stable steady states were reached after an initial adjustment phase of 5 to 10 hr and remained stable until the experiment was terminated after 22 hr. These results show that non-oscillating networks also function in the cell-free environment and that the oscillations we observe for the 3-node networks are determined by network architecture and not established by particular reaction conditions in the microfluidic reactor. Encouraged by the robust oscillations observed in the 3n networks and the expected behavior of the 4-node bistable switch, we built two 5-node ring networks (5n) to test our prototyping environment on another novel synthetic network architecture (Figure 3E). We expected these circuits to oscillate, as they were built from an odd number of repressors. Despite their considerable complexity both circuits indeed oscillated over a broad range of dilution times. The period of the 5n networks (up to 19 hr) was significantly longer than that of the 3n networks (up to 8 hr). Comparing all ssrA-tagged 3n and 5n ring architectures, we show that the observed periods could be accurately predicted for all four networks by computational simulations (Figure 3F). Our cell-free system allows characterization of complex networks from rapid testing on linear DNA to verifying networks cloned onto a single plasmid, which is the closest approximation to cellular implementation (Figure 1—figure supplement 1). To validate our cell-free approach we cloned the 3n1 and 3n2 networks onto low-copy plasmids and co-transformed each with a medium-copy reporter plasmid into lacI-JS006 E. coli (Stricker et al., 2008). When tested on a microfluidic device (mother machine (Wang et al., 2010)), both 3n oscillators showed regular oscillations with periods of 6 ± 1 hr for at least 30 hr (Figure 4A, Videos 2,3). Both oscillators were surprisingly robust as all cells undergoing healthy cellular division oscillated (n=71) (Figure 4—figure supplement 1, Video 4). Novel 3-node and 5-node ring oscillators in cells. (A) Time series traces of 3-node ring oscillators running in E. coli (mother machine). 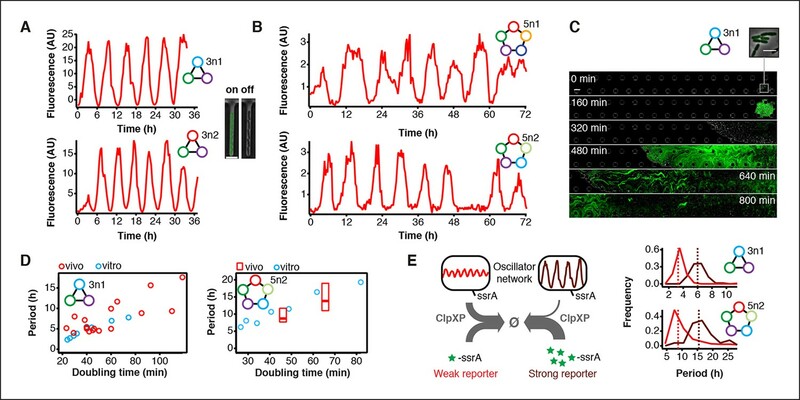 Single trap traces of 3n1 and 3n2 observed for 36 hr in vivo using a strong pPhlF sfGFP-ssrA reporter and a representative image from an ‘on’ and ‘off’ state of oscillation. Scale bar: 5 µm. (B) Time series traces of 5-node ring oscillators running in E. coli (mother machine). Single trap traces of 5n1 and 5n2 observed for 72 hr in vivo using a weak pPhlF sfGFP-ssrA reporter. (C) 3n1 displays population-wide oscillation pulses in vivo (CellASIC). Time series micrographs of 3n1 under a strong pPhlF sfGFP-ssrA reporter every 160 min; inset shows individual cells of the initial microcolony. Scale bar: 10 µm and 5 µm (inset). (D) Relationship between period and division time in vivo. Left, 3n1 in vivo under a strong pPhlF sfGFP-ssrA reporter. The in vitro data is shown for comparison. Each point in the in vivo data corresponds to the period and division time from aCellASIC experiment run under different media type and flow rates. Right, 5n2 in vivo under aweak pPhlF sfGFP-ssrA reporter. In vivo periods determined at 29ºC and 21ºC growth temperature in mother machine experiments. Boxes represent the inner quartile range with the median. (E) Influence of reporter concentration on oscillation periods by competing for ClpXP degradation. Left, with constant amounts of ClpXP the reporter concentration affects repressor degradation and thus oscillation period. Histograms of the periods observed with a weak and a strong pPhlF sfGFP-ssrA reporter for both 3n1 and 5n2 run in the mother machine. Dashed lines indicate the medians. 3n1 in mother machine, single trap. 3n1 using a pPhlF-BCD20-sfGFP-ssrA (strong) reporter is run in the mother machine at 29ºC in LB. 3n2 in mother machine, single trap. 3n2 using a pPhlF-BCD20-sfGFP-ssrA (strong) reporter is run in the mother machine at 29ºC in LB. Run of a panel of 3n2 oscillators in mother machine, using pPhlF-BCD20-sfGFP-ssrA (strong) reporter. We next turned to testing our 5n oscillators in vivo. Like the 3n networks we cloned both 5n oscillators onto low-copy number plasmids to transfer the two networks we had initially prototyped on linear DNA (Figure 3E) into E. coli. Figure 1—figure supplement 1 shows the complete cell-free prototyping cycle for the 5n1 oscillator from design by testing on linear DNA to validation of the final cloned oscillator plasmid. In E. coli, 5n1 was not viable when co-transformed with a high expression-strength reporter, but was viable with a low expression-strength reporter. Specifically, 5n1 with a high expression-strength reporter caused slow growth and high cell death rates when run on the mother machine – we hypothesize that this is due to loading effects from high protein production, as decreasing the reporter expression strength resolved cell viability issues (Ceroni et al., 2015). When tested with a low expression-strength reporter both 5n oscillators showed robust oscillations in E. coli that were maintained for at least 70 hr, and over 95% of all analyzed traps containing healthy cells oscillated (n=104). In addition, both 5n networks oscillated with similar periods: 8 hr for 5n1, and 9 hr for 5n2 (Figure 4B, Figure 4—figure supplement 1, Videos 5–7). 5n1 using a pPhlF-BCD22-sfGFP-ssrA (weak) reporter is run in the mother machine at 29ºC in LB. 5n2 using a pPhlF-BCD22-sfGFP-ssrA (weak) reporter is run in the mother machine at 29ºC in LB. Run of a panel of 5n2 oscillators in mother machine, using pPhlF-BCD22-sfGFP-ssrA (weak) reporter. We also tested both 3n oscillators on a CellASIC system, which allows planar single-layer colony formation. Starting from a single cell we observed striking oscillation pulses of the entire growing microcolony (Figure 4C, Figure 4—figure supplement 2, Videos 8,9). These population level pulses were also apparent when using three different fluorescent reporters simultaneously (Figure 4—figure supplement 3, Video 10). We did not observe population level oscillations in either the original repressilator, the OR2* mutant (Figure 4—figure supplement 4) or the 5n networks. Synchronized oscillations were not reported with the original repressilator (Elowitz and Leibler, 2000), and have only been observed in oscillators using intercellular communication (Danino et al., 2010; Prindle et al., 2012). In contrast to these quorum-sensing mechanisms that can actively couple and synchronize oscillator states (Danino et al., 2010; Prindle et al., 2012) we do not believe the population-wide in-phase oscillations we observed are due to an active coupling mechanism. We hypothesize that the population-level oscillations of the 3n1 and 3n2 networks are due to increased repressor concentrations as compared to the original repressilator network, which increases the inheritance of the period phenotype and minimizes the rapid de-phasing expected from stochastic cellular protein fluctuations (Kiviet et al., 2014). However, a quantitative characterization of this slow de-phasing phenotype requires more in depth understanding of stochastic effects in vivo. Because cells stayed synchronized, we were able to analyze the population as a whole to make general conclusions of oscillator behavior. We varied dilution time by using different media conditions and media flow rates, and found a direct relationship between division times and period, consistent with the cell-free data collected. Oscillation periods of the 5n oscillators were also consistent with our cell-free results and showed a similar dependence on doubling time (Figure 4D). 3n1 in CellASIC. 3n1 using a pPhlF-BCD20-sfGFP-ssrA (strong) reporter is run in CellASIC. This video corresponds to Figure 4C. Conditions: 29º°C, LB media, 12.5% lamp intensity, 200 ms exposure, 2 psi flow rate. 3n2 in CellASIC. 3n2 using a pPhlF-BCD20-sfGFP-ssrA (strong) reporter is run in CellASIC. This video corresponds to Figure 4—figure supplement 2. Conditions: 29ºC, LB media, 12.5% lamp intensity, 200 ms exposure, 2 psi flow rate. 3n2 with 3-color output run in CellASIC. 3n2 using a pPhlF-BCD20-Citrine-ssrA, pTetR-BCD20-mCherry-ssrA, pSrpR-Cerulean-ssrA (strong) reporter is run in CellASIC. This video corresponds to Figure S5B. Conditions: 29 C, LB media, 12.5% lamp intensity, 200 ms exposure for Citrine and Cerulean (500 ms for mCherry), 2 psi flow rate. Finally, we compared 3n1 and 5n2 with weak and strong reporters in vivo to analyze the effect of protein degradation on the oscillator period. We theorized that given a constant concentration of ClpXP, stronger reporters would result in more ClpXP loading, thereby slowing the period of oscillation. ClpXP is thought to influence oscillation dynamics in vivo in this manner (Cookson et al., 2011). We found that in the mother machine, both the period distributions of 3n1 and 5n2 showed this characteristic (Figure 4E), which reflects our cell-free findings of differential –ssrA tag dependent period length (Figure 3C). We showed that synthetic dynamic networks can be readily implemented, characterized, and engineered in a cell-free system and subsequently transferred to cellular hosts (Figure 1). Our results demonstrate the utility of this approach for biological systems engineering and component characterization. The cell-free system resulted in the experimental validation of previous theoretical predictions on even- and odd-numbered cyclic negative feedback circuits (Smith, 1987; Hori et al., 2013) and enabled the in vivo implementation of robust 5-node genetic oscillators. The cell-free environment can thus fill the gap between theoretical network design and in vivo implementation of biological systems and provide a simplified and controlled environment that drastically reduces the design-build-test cycle (Sun et al., 2014). In order to match the cell-free and cellular environments as closely as possible we prepared an extract-based TX-TL expression system from the same E. coli strain we used for in vivo experiments by a method that preserves the endogenous biosynthetic and protein degradation machinery (Shin and Noireaux, 2010a; 2010b; 2012; Sun et al., 2013). Similar expression systems had previously been applied to the prototyping of promoters and ribosomal binding sites (Sun et al., 2014; Chappell et al., 2013). 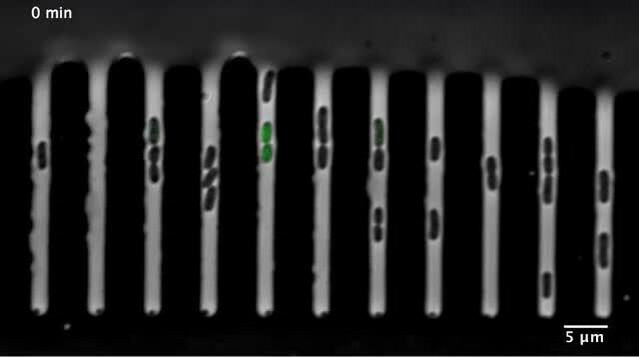 Here we showed that they can also be used for the prototyping of entire genetic networks when they are analyzed in a microfluidic system that emulates cellular growth. Oscillation periods in negative feedback ring oscillators are mainly determined by degradation and dilution rates (Hori et al., 2013), which explains the good correspondence between oscillation periods in our cell-free environment and in E. coli. By constructing and testing novel network architectures we show that almost all prototyping can be done on linear DNA, which requires less than 8 hr to assemble and test. This allows rapid screening of different network topologies and rapid screening of parameters important for the desired function of a network. We observed some differences between the cell-free and cellular environment, particularly in the difficulty of predicting cellular toxicity and loading effects of the 5n oscillators in vivo, and some differences between promoter and repressor strengths. With a better understanding of loading effects cell-free prototyping environments may predict when cells will be overloaded. We also add that the complete cell-free prototyping cycle that worked for 5n1 (Figure 1—figure supplement 1) was not entirely successful for the 5n2 network. 5n2 showed similar oscillations as compared to 5n1 when analyzed on linear DNA in the cell-free environment (Figure 3E) and on plasmid DNA in E. coli (Figure 4), but we did not observe oscillations for 5n2 when run from the same plasmid DNA in the cell-free environment. We hypothesize this is due to differences in expression efficiencies from linear and plasmid DNA in cell-free prototyping environments (Sun et al., 2014; Chappell et al., 2013), and/or differences between repressor strengths in the cell-free and the cellular environment (particularly for QacR, Figure 3—figure supplement 3). While more work is necessary describing and explaining differences between in vitro and in vivo environments, the observed behavior of complex networks in our cell-free environment reflected network behavior in vivo well. Cell-free systems are thus a powerful emulator of the cellular environment allowing precise control over experimental conditions and enabling studies that are difficult or time consuming to perform in cells. We envision that it will not only be useful for prototyping and characterizing novel synthetic systems but also facilitate in-depth analyses of native biological networks in a simplified setting. With further developments in cell-free lysate systems and supporting technologies, the cell-free approach is posed to play an increasing role in biological systems engineering and provides a unique opportunity to design, build, and analyze biological systems. DNA was constructed using either Golden Gate Assembly or Isothermal Assembly. For linear DNA, all DNA was constructed using previously published Rapid Assembly protocols on a ‘v1-1’ vector (Sun et al., 2014). Linear DNA constructs are summarized in Supplementary file 1A. The original repressilator plasmid, pZS1 (Elowitz and Leibler, 2000) was used as a template for initial characterization and for construction of the OR2* mutant. Transfer function plasmids were constructed by Transcriptic, Inc. For other plasmids, partial sequences were either obtained from Addgene (Stanton et al., 2014) or synthesized on gBlocks or ssDNA annealed oligonucleotides (Integrated DNA Technologies). Specific plasmids required secondary-structure free segments, which were designed by R2oDNA (Casini et al., 2014). JS006 (Stricker et al., 2008) was co-transformed with origin-of-replication compatible plasmids to create engineered strains. Specifically, negative-feedback oscillator units were cloned onto pSC101* low copy plasmids (ampR or kanR), while reporters were cloned onto colE1 medium copy plasmids (kanR or cmR) (Supplementary files 1B,C). To modulate the reporter copy number, all experiments were conducted below 37°C (Fitzwater et al., 1988). Strain passage was minimized to avoid plasmid deletions due to the recA + nature of JS006 and the high complexity of oscillator plasmids or triple-reporter plasmid. Based on the in vitro and in silico results, we used strong transcriptional and translational (Mutalik et al., 2013) units to maximize gain. Preparation of TX-TL was conducted as described previously (Sun et al., 2013), but using strain 'JS006' co-transformed with Rosetta2 plasmid and performing a 1:2:1 extract:DNA:buffer ratio. This resulted in extract ‘eZS4’ with: 8.7 mg/mL protein, 10.5 mM Mg-glutamate, 100 mM K-glutamate, 0.25 mM DTT, 0.75 mM each amino acid except leucine, 0.63 mM leucine, 50 mM HEPES, 1.5 mM ATP and GTP, 0.9 mM CTP and UTP, 0.2 mg/mL tRNA, 0.26 mM CoA, 0.33 mM NAD, 0.75 mM cAMP, 0.068 mM folinic acid, 1 mM spermidine, 30 mM 3-PGA, 2% PEG-8000. For experiments utilizing linear DNA GamS was added to a final concentration of 3.5 µM (Sun et al., 2014). Experiments were performed in a microfluidic nano-reactor device as described previously (Niederholtmeyer et al., 2013; Sun et al., 2013) with some modifications to optimize the conditions for the lysate-based TX-TL mix. Reaction temperature was 33°C. Lysate was diluted to 2x of the final concentration in 5 mM HEPES 5 mM NaCl buffer (pH 7.2). The reaction buffer mix was combined with template DNA and brought to a final concentration of 2x. For a 24 hr experiment 30 µl of these stocks were prepared. During the experiment, lysate and buffer/DNA solutions were kept in separate tubing feeding onto the chip, cooled to approximately 6ºC, and combined on-chip. We ran experiments with dilution rates (µ) between approximately 2.8 and 0.5 hr-1, which corresponds to dilution times, td = ln(2) µ-1, between 15 and 85 min. These were achieved with dilution steps exchanging between 7 and 25% of the reactor volume with time intervals of 7 to 10 min, which alternately added fresh lysate stock or fresh buffer/DNA solution into the reactors. Dilution rates were calibrated before each experiment. Initial conditions for the limit cycle analysis of the repressilator network were set by adding pre-synthesized repressor protein at the beginning of each experiment. For this, CI repressor (together with Citrine reporter) and TetR repressor (together with Cerulean reporter) were expressed for 2.5 hr in batch. On chip the initial reaction was mixed to be composed of 25% pre-synthesis reaction and 75% fresh TX-TL mix and repressilator template DNA. Then, the experiment was performed at a td of 19.2 ± 0.3 min. Initial conditions for the 4-node experiment were 2.5 µM aTc or 250 µM IPTG, and the experiment was performed at a td of 44.5 ± 0.9 min. DNA template concentrations used in steady-state reactions are listed in Supplementary file 1D. Arbitrary fluorescence values were converted to absolute concentrations from a calibration using purified Citrine, Cerulean, and mCherry, which were prepared using previously published protocols utilizing a His6 purification method followed by size-exclusion chromatography and a Bradford assay to determine protein concentration (Sun et al., 2014). where y is the synthesis rate, ymin is the minimum synthesis rate, n is the Hill coefficient and KM is the Michaelis Menten constant for half maximal promoter activity. The fitting was performed in Igor Pro using orthogonal distance regression with ODRPACK95 assuming a 9% error in the measurements of Citrine and Cerulean fluorescence. Relative promoter strengths (vmax values) were determined using the transfer function promoter plasmids. In vitro strengths were determined in 5 µl TX-TL reactions at a DNA template concentration of 1 nM. Reactions were assembled in 384-well plates, overlaid with 35 µl Chill-Out Liquid wax (BioRad) and analyzed using a Biotek SynergyMx plate reader set to 33ºC reaction temperature, and reading Citrine fluorescence with Exc: 510 ± 9 nm and Em: 540 ± 9 nm. For comparison, Citrine fluorescence at 6 hr was normalized to the value of pLacI. In vivo strengths were determined using E. coli JS006 transformed with the same plasmids. Cells were grown at 29ºC in MOPS medium supplemented with 0.4% glycerol and 0.2% casaminoacids. For each strain, three independent overnight cultures were diluted 1:50 and grown to mid-log phase. They were then diluted to a starting OD600 of 0.15 into 100 µl growth medium in a 96-well plate and grown in the plate reader at 29ºC with periodic shaking measuring Citrine fluorescence. Fluorescence values were normalized to OD resulting in steady state values after 2 hr. Average steady state values were normalized to pLacI for comparison with the in vitro measurement. Mother machine (Wang et al., 2010) experiments were conducted with custom-made microfluidic chips (mold courtesy of M. Delincé and J. McKinney, EPFL). E. coli cells were trapped in channels of 30 µm length, 2 µm width and 1.2 µm height. Before loading onto the device, cells were grown from a frozen stock to stationery phase. Cells were then concentrated tenfold and loaded onto the chip. Experiments were performed using LB medium supplemented with 0.075% Tween-20 at a flow rate of 400 µl/hr. Oscillation traces were collected from single mother machine traps using the background subtracted average fluorescence intensity of the entire trap. CellASIC experiments were conducted using B04A plates (Merck Millipore, Darmstadt Germany). Flow rates were varied between 0.25 psi – 2 psi. Cells were grown from frozen stock in media at running temperature to stationery phase. Cells were then diluted 1:100 for 2 hr, and loaded on a equilibrated plate at 1:1000 or less to achieve single-cell loading efficiencies per chamber. To vary cellular doubling times, different growth media were used: LB (BD Biosciences), M9CA (Sigma Aldrich) with 0.2% glucose, 2xYT (MP Bio), MOPS EZ Rich (Teknova). Cells were imaged in time series every 10-–20 min using a 100x phase objective minimizing both lamp intensity (12% Xcite 120, Excelitas Inc. Waltam MA or 1–2% CoolLED pE-2, Custom interconnected Ltd., UK) and exposure times (<500 ms) to limit photo-toxicity. Images were processed and stitched (Preibisch et al., 2009), if necessary, using Fiji/ImageJ (Schindelin et al., 2012). Fluorescence traces of cell populations with synchronized oscillations were extracted from CellASIC movies using background corrected mean fluorescence intensity from the entire field of view. For cells that were not synchronized over the complete field of view, we tracked regions of oscillating sister cells at the edge of the microcolony. We used ImageJ to define polygonal regions around those cells and manually shifted the polygonal region to track the front of growing cells. Periods were determined from fluorescence traces derived from mother machine and CellASIC movies by measuring the time from one oscillation peak to the next peak. Doubling times were estimated by averaging over the doubling times of at least ten individual cells. We consider an n-node negative cyclic feedback biocircuit and denote the genes, mRNAs and proteins by G1, G2, …, Gn, and M1, M2, …, Mn and P1, P2, …, Pn, respectively. Let ri(t) and pi(t) denote the concentrations of mRNA Mi and protein Pi, respectively. For example, the novel 3-node ring oscillator in Figure 3B is defined by n=3, r1(t) = [BetI mRNA], r2(t) = [PhlF mRNA], r3(t) = [SrpR mRNA], p1(t) = [BetI protein], p2(t) = [PhlF protein], p3(t) = [SrpR protein]. Our mathematical model considers transcription, translation and degradation of mRNA and protein molecules as summarized in Table 1, where ai and bi represent the degradation rates of Mi and Pi, respectively, and ci and βi are the translation and transcription rates. The constants Ki-1 and νi are the Michaelis-Menten constant and the Hill coefficient associated with the protein Pi-1 and the corresponding promoter on gene Gi. We hereafter use subscripts 0 and n + 1 as the substitutes of n and 1, respectively, to avoid notational clutter. The ODE model (Equation 6) was numerically simulated using ode45 solver of MATLAB R2013b to obtain qualitative insight into the period as well as the oscillatory parameter regime (Figure 3F and Figure 2—figure supplement 2). The parameters summarized in Table 2 were used for the simulations. The plasmid concentration g was set as g = 5.0 nM for Figure 3F. The initial concentrations for the simulations were r1(0) =30, p1(0) =0 and ri(0) = pi(0) = 0 for i = 2,3,..., n.
where T1 is a positive constant such that p1(t) is steady state at t = T1, and T2 is a sufficiently large constant compared to the period of oscillations. The period of oscillations Tperiod was determined by Tperiod = minτ>0 argmaxτR(τ). The simulation result is also consistent with the analytic estimation of the oscillation period in Hori et al. (Hori et al., 2013) in that the period increases monotonically with the dilution time Td. The parameter region for oscillations (Figure 2—figure supplement 1) was obtained based on the analysis result (Theorem 3) by Hori et al. (Hori et al., 2011). Since parameter values do not depend on the subscript i as shown in the parameters table above, we remove the subscript i and define a : = a1 ( = a2 = … an). In the same way, we define b, c, β, K and ν. It was shown that the protein concentrations pi (i = 1,2,…, n) oscillate if both of the following inequalities are satisfied (Hori et al., 2011). W(n,Q) :=2(−cos(πn)+cos2(πn)+Q2sin2(πn))Q2sin2(πn) and Q :=(a+d)(b+d)(a+b+2d)/2. To obtain the parameter region in Figure 2—figure supplement 1, we substituted n =3 and the parameters shown in the table above into the right-hand side of the inequality condition (Equation 10), then we varied Td(= ln(2)/µ) between 5 to 80. The inequality (Equation 9) was always satisfied for these parameters. The parameter region of Figure 2—figure supplement 3 was obtained by the local stability analysis of the model (Equation 6). The previous theoretical result (Hori et al., 2011) showed that the model (Equation 6) has a unique equilibrium point and the protein concentrations pi (i = 1,2, …, n) show stable oscillations if the Jacobian matrix evaluated at the equilibrium point has an eigenvalue in the open right-half complex plane. Based on this result, we computed the Jacobian eigenvalues with varying K3, which we denote by KcI, and Td. The values in the parameters table above were used for the other parameters. The plasmid concentration was set as g = 5.0 nM in the computation. Proceedings of the National Academy of Sciences 110:15985–15990. Proceedings of the National Academy of Sciences 100:12672–12677. Critical Reviews in Biochemistry and Molecular Biology 44:223–242. Journal of Biological Engineering 4:8–9. Journal of Biological Engineering 4:9. Journal of Mathematical Biology 25:169–190. Journal of Visualized Experiments 79:e50762. Thank you for submitting your work entitled "Rapid forward engineering of novel genetic ring oscillators" for peer review at eLife. Your submission has been favorably evaluated by Naama Barkai (Senior editor), Friedrich Simmel (guest Reviewing editor), and two reviewers. The article by Niederholtmeyer et al. demonstrates the realization of 3-node and 5-node genetic ring oscillators in a cell-free transcription/translation system, using a microfluidic nanoreactor with tunable dilution rate. After prototyping the oscillator circuits in vitro, they are implemented in E.coli and shown to function in vivo with similar dynamics, demonstrating a remarkable portability from in vitro to in vivo systems. This is important work, which significantly advances the state-of-the art in terms of circuit design and experimental approach. In particular, the article also contains the first realization of a synthetic 5-node genetic ring oscillator, which functions both in vitro and in vivo. The results themselves do not provide any new biological insight, but raise potentially interesting biological questions that could be addressed in more detail. For instance, the ability of 3n1 and 3n2 constructs to show population level oscillations is biologically interesting, but unfortunately remains a mere observation with a speculative interpretation. It may also be misleading to term the observation "population level synchronization" (as in the last paragraph of the Main text). For synchronization, one would also expect evolution from an initially unsychronized state towards synchrony. In the present experiments, the bacteria start in a synchronized state and stay approximately synchronized due to slow dephasing (this interpretation is given in the subsection “Transfer of in vitro prototyped 3- and 5-node oscillators to E. coli”). Thus the observation might have a very different cause than the prototypical synchronization of coupled oscillators (as for quorum sensing-coupled bacteria). In addition, the fact that the 5n networks had to be altered in order to function in vivo due to the system load is another avenue of continuing research that is left open ended by this current manuscript. Is it possible to add more biological insight? It is quite surprising that the approach taken by the authors actually works so well. Previous work on cell-free circuits did not show oscillatory dynamics (except for two publication cited in the text) because of low enzyme activity and long protein lifetimes, etc. It would be useful for the readers if the authors could point out the decisive technical steps that had to be taken for their work – the specific cell-extract used, the microfluidic dilution system, etc.? In this context, can the authors comment on what they believe are the most important variables necessary to control for matching in vitro and in vivo environments? Furthermore, the authors could more closely compare the time to implement designs both in their TX-TL systems and in cells? What is the true cost and time savings when working in vitro versus with E. coli? The manuscript deals with variety of different experimental implementations of the oscillators, which can be slightly confusing at times. For instance, the 3n1 oscillator is implemented on a plasmid, while the 3n2 network is implemented on linear DNA. This is not motivated, however. Is this done for simplicity and faster prototyping? Furthermore, it is not completely clear why the authors work with two different microfluidic systems for the experiments with bacteria – the "mother machine" (allowing simple single cell experiments?) and the CellASIC system (allowing single layer growth?). Figure 3 contains experiments with both of these two systems – can they be directly compared? Figure 4 does a great job highlighting the main point of the paper, and this figure or a similar figure could come earlier in the manuscript to guide the reader towards the fact that speed is the true breakthrough. Showing/expanding Figure 4 to include what its in vivo only counterpart would look like, with associated time lines between the two methods, would be helpful to stress that speed is the main advantage here. Essential revisions: 1) Biological significance: The results themselves do not provide any new biological insight, but raise potentially interesting biological questions that could be addressed in more detail. For instance, the ability of 3n1 and 3n2 constructs to show population level oscillations is biologically interesting, but unfortunately remains a mere observation with a speculative interpretation. It may also be misleading to term the observation "population level synchronization" (as in the last paragraph of the Main text). For synchronization, one would also expect evolution from an initially unsychronized state towards synchrony. In the present experiments, the bacteria start in a synchronized state and stay approximately synchronized due to slow dephasing (this interpretation is given in the subsection “Transfer of in vitro prototyped 3- and 5-node oscillators to E. coli”). Thus the observation might have a very different cause than the prototypical synchronization of coupled oscillators (as for quorum sensing-coupled bacteria). We agree with the reviewers that the term “synchronization” was misleading. We did not want to imply that the population-wide oscillation we observed with 3n1 and 3n2 resulted from an active mechanism coupling the oscillator states in different cells. We removed the term “synchronization” throughout the manuscript and replaced it by “population-level” or “population-wide oscillations” to describe our observation. We extended the description of our observation and made the distinction from active synchronization mechanisms involving intercellular communication clearer. Just like the reviewer states, we explain the population-level oscillations we observed in growing microcolonies with a slow dephasing of cells that descended from a common mother cell. Our hypothesis is that this is due to increased repressor concentrations in cells carrying the 3n1 and 3n2 networks as compared to other oscillator networks for which we did not observe similar population-wide oscillation pulses. Higher protein concentrations would lead to reduced stochastic fluctuations during cell divisions and increase inheritance of the oscillator state from mother to daughter cells. We believe that these striking population-wide oscillations are an interesting observation that merits inclusion into our paper. With our focus on the engineering, prototyping and transfer of novel networks into cells it is however beyond the scope of our study to go into more detail on the stochastic effects that caused this interesting phenotype. 2) Technical issues: It is quite surprising that the approach taken by the authors actually works so well. Previous work on cell-free circuits did not show oscillatory dynamics (except for two publication cited in the text) because of low enzyme activity and long protein lifetimes, etc. It would be useful for the readers if the authors could point out the decisive technical steps that had to be taken for their work – the specific cell-extract used, the microfluidic dilution system, etc.? We expanded the technical description of the TX-TL cell-free expression reagents and the microfluidic nano-reactor device we employ in the beginning of the Results section to make these points clearer. We believe that our approach worked so well because we combine a powerful expression system featuring high synthesis rates from E. coli promoters with precise dilution that the microfluidic device allows. Dilution allows synthesis to proceed at steady state solving the problems of declining enzyme activities and accumulation of proteins with long lifetimes. Preparation of the cell-extract is described in the Materials and methods in reference to previous work. In the revised version of our manuscript we added more details on the cell-extract into the main text and highlight more explicitly publications that described preparation, characterization and application of similar E. coli prototyping extracts. We also explain in more detail the function of the microfluidic device. We would be happy to elaborate further. Previous work has described that it is possible to prototype promoters, ribosomal binding sites and small networks in cell-free environments. Preparation of the extract is important to preserve activity of the endogenous transcription and translation machinery and has been described previously. The extract also contains native enzyme responsible for mRNA and protein degradation. In combination with continuous dilution maintained by a microfluidic reactor device at rates that match dilution by cellular growth this results in removal of reaction products, which is critical for the implementation of dynamic genetic networks. It is also worth mentioning that we used the same E. coli strain to prepare the cell-extract as to perform the in vivo experiments. To supplement the expanded section on the decisive technical steps we took to match both environments in the beginning of the paper, we added to the discussion to give an explanation why periods of the oscillators matched so well in the cell-free and the cellular environment. We also added on the critical discussion to highlight that more work is necessary to describe and explain differences that exist between the in vitro and the in vivo environment we observed and had also already partly been described by others. We agree that one of the strengths of the TX-TL system is the rapid turnover of experiments and data, and to address the point we’ve expanded the new Figure 1 to include a timeline for working in cell-free vs. with E. coli. In terms of cycle count, the table in Figure 1 includes “typical expectation.” We’ve added a section to the text to explicitly address the time savings when using TX-TL. In terms of actual time to engineering in “PhD time”, we note that the collaboration between H. Niederholtmeyer and Z. Sun started in November 2013. The first proof of the repressilator functioning in vitro came in March 2014, and from March to July we characterized the repressilator. We successfully tested novel 3 node and 5 node architectures in vitro in a 1-month span, July 2014. The majority of the time, from August 2014 to the completion of the manuscript in April 2015, was spent transitioning our oscillator networks to in vivo compatible plasmids and diagnosing in vivo oscillations. Both H. Niederholtmeyer and Z. Sun estimate ½-person effort across the research period, thereby approximating 0.75-1 person-years to produce the results in the manuscript. While we do not have direct experience building dynamic circuits solely in vivo, we believe that the 0.75-1 person-year estimate compares advantageously to other efforts that rely only on in vivo prototyping, as we found the majority of our time dedicated to diagnosing in vivo issues (cell viability, cloning issues, finding optimum imaging solutions, etc.). 3) Presentation: The manuscript deals with variety of different experimental implementations of the oscillators, which can be slightly confusing at times. For instance, the 3n1 oscillator is implemented on a plasmid, while the 3n2 network is implemented on linear DNA. This is not motivated, however. Is this done for simplicity and faster prototyping? In order to test if the cell-free environment could be potentially useful for prototyping of genetic networks with complex dynamics and transferring these between cell-free and cellular environments, we first tested the repressilator as a model circuit. Because this was an in vivo circuit it was located on a plasmid. When we found that it worked in the cell-free environment, we cloned the next novel network (3n1) onto a similar plasmid because this is the closest approximation to the situation in cells. When this novel network also worked, we decided to test even more novel network architectures. The real advantage of prototyping in a cell-free environment becomes clear when laborious cloning steps can be abolished for initial testing of networks, which is why we tested all further networks (3n2, 4n, 5n1, 5n2) first on linear DNA. Especially for large networks such as the 5-node oscillators the plasmid carrying the network becomes large and laborious to clone. In fact, if we had not found in our cell-free experiments with linear DNA that they had the potential to work in cells, we would not have attempted to implement them in E. coli and carried on when toxicity and loading effects further slowed cloning and in vivo testing. Seen in this historical context of our experiments we believe that the different implementations of our networks make sense. We made this logic clearer in the manuscript highlighting the advantage of linear DNA for rapid prototyping and added the mode of implementation (“Plasmid DNA” or “Linear DNA”) to Figure 2 (now Figure 3) to avoid confusion. Additionally, we would like to point the reviewers to Figure 1–figure supplement 1 (former Figure 4–figure supplement 1), where we show on the example of 5n1 how we imagine that prototyping can be done first on linear DNA and then verified on plasmid DNA. In addition to this logic of faster prototyping we have to add that 5n2 did not oscillate on plasmid DNA in the cell-free environment, whereas the network oscillated when implemented on linear DNA and on plasmid DNA in E. coli. We speculate that the reason why the 5n2 plasmid failed in vitro may be differences in expression efficiencies between linear and plasmid DNA that have been described previously, in combination with differences between repressor strengths in the cell-free and the cellular environment (particularly in QacR, see Figure 2–figure supplement 3). We included this example into our revised manuscript to show that while overall networks behaved very similarly in the cell-free and the cellular environment, more work is necessary to overcome some remaining technical challenges and to describe and explain differences that exist between the two environments. We found separate advantages and disadvantages to using either system. The reviewers are correct in that the mother machine allows for easier single cell experiments, while the CellASIC allows for observation of a population in a single layer growth environment. For experiments requiring single-cell analysis, we utilized the mother machine. CellASIC generally allows for more data collection, as we had the option of varying 4 variables in one run (vs. 1 variable for the mother machine). We therefore used these runs to populate the data in Figure 4D, for 3n1, and to demonstrate population-level oscillations. However, we could not use the CellASIC to glean useful data for the 5-node oscillators, as oscillation periods were too long for the CellASIC runtime and cells did not demonstrate population-level oscillations. Therefore, all 5-node oscillator data was collected in the mother machine. We did not try to directly compare the two systems, but rather attempted to keep each panel consistent on its data collection method. We thank the reviewers for the comments. We agree that Figure 4 would serve better as a summary slide, and that speed is important to emphasize. To that end, we have shifted Figure 4 to be Figure 1, added a bar to describe time, and added a source data table, which breaks down the time estimate. Please see responses to earlier comments for additional information. ZZS, RMM have ownership in a company that commercializes the cell-free technology utilized in this paper. We thank Yin He, Transcriptic, Inc. and Holly Rees for cloning assistance, Jan Kostecki and Stephen Mayo for protein purification and size exclusion chromatography assistance, Rohit Sharma and Marcella Gomez for initial testing and modeling of oscillators in vitro, Kyle Martin for laboratory assistance, Adam Abate, Tanja Kortemme, and Charles Craik for laboratory space and equipment, Matthieu Delincé, Joachim De Jonghe, Marc Spaltenstein, John McKinney and Jin Park for mother machine material and assistance, Tim Chang and Benjamin Alderete for CellASIC assistance, and Michael Elowitz for insights and scientific support. This work was supported in part by EPFL and the Defense Advanced Research Projects Agency (DARPA/MTO) Living Foundries program, contract number HR0011-12-C-0065 (DARPA/CMO). ZZS is also supported by a UCLA/Caltech Medical Scientist Training Program fellowship, ZZS and EY by a National Defense Science and Engineering Graduate fellowship, and YH by a JSPS Fellowship for Research Abroad. The views and conclusions contained in this document are those of the authors and should not be interpreted as representing officially policies, either expressly or implied, of the Defense Advanced Research Projects Agency or the U. S. Government. © 2015, Niederholtmeyer et al. A cell-free approach reveals how genetic circuits can produce robust oscillations of proteins and other components.